Lorraine Rowan Smith. Photo courtesy of Johan van Waart. During our Band of Brother group’s Liberation re-enactment weekend in Brielle, Netherlands, held from May 4th to May 7th 2017, I conducted a ceremony for Lorraine Rowan Smith. 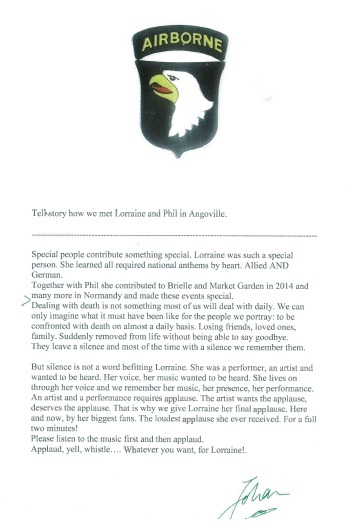 Lorraine, together with her husband Phil, attended the Bevrijdingsfestival Brielle many times, entertaining the crowd with renditions of ‘40s songs. Her lovely voice will be remembered by many. Far too early, Lorraine passed away in March of this year. When I was writing the short text intended for the ceremony, I assumed that we would conduct a minute’s silence. However, part of the ceremony would also be done by our re-enactment Chaplain who would say a prayer for all those who passed away in the last year and would already ask for a minute’s silence. Then, as a bolt from the blue, Lorraine put a thought in my head: my part was to say something to remember Lorraine. And Lorraine being an artist, a silence would not be appropriate. Click on image of Johan’s speech to enlarge it. A number years ago, my re-enactment group attended the D-day commemorations in Normandy, as we do every year. Early one day, we were in Angoville, France for a special ceremony for the 101st Airborne medics who set up a medic post there in the church. An English couple was unloading equipment from a van and needed help. It appeared they were the “act,” and Lorraine, performing under her artist name “Memphis Belle,” would sing a few songs and national anthems. Although it was not quite clear yet when and what she would sing. With help of a kind Belgian lady whose French was better than mine, we got it sorted out with the organisation. You can watch a video of the ceremony. Thank you to Eddy Bertels for sharing the video.